This new elevated cabana will be a truly unique experience. 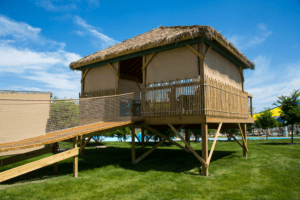 Cross over the rope bridge to this tiki-style hut which is 6 feet in the air, giving you the best view of Kookaburra Kreek. This cabana is definitely upHIGHa than the rest! UpHIGHa Hut includes upgraded chairs, table and lounge chairs for 14 guests, daily treat, fan, fridge and wait staff service until 3pm. Make sure to be first in line, as there is only ONE upHIGHa Hut. Only 1 form of payment allowed for wait service. Take a look inside UpHigha Hut!